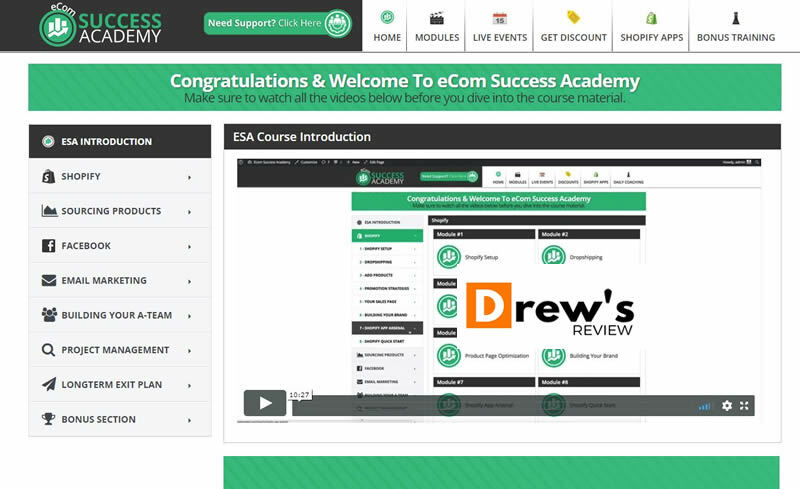 eCom Success Academy Review - Is There a Better Alternative? 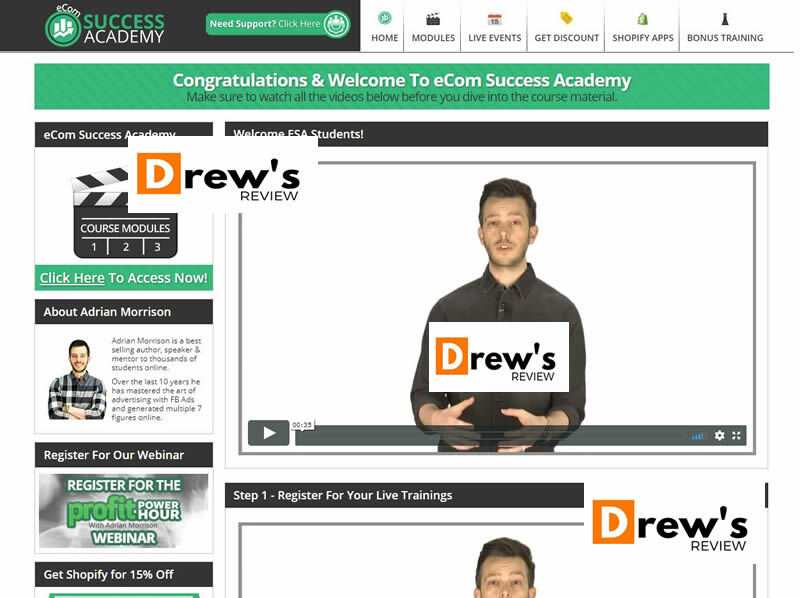 Hey, so today I am going to review Adrian Morrison’s Ecom Success Academy and yes I am a real member. I am going to take you through the course and then I am going to tell you why I think there is a better alternative to this course. So you’ll want to stick around to the end. So What is eCom Success Academy? Ecom Success Academy is an online course in drop shipping created by Adrian Morrison. He teaches you how to start your own ecom drop shipping business through Shopify. You will learn everything in this course from setting up your store, picking a niche, creating Facebook ads and scaling your store. I purchased ecom success academy – also known as ESA a couple years ago and if i remember correctly it was a cool $2500.00 USD. What irked me a bit was the no refunds policy. However, I felt that I was going to make my money back with ecom anyway, so the price tag was worth it, I thought. I wanted to delve into Shopify Dropshipping, so I went all in. Let’s take a look at the members area now shall we? Now, I put my logo all over it (and made it look real ugly too) because I know some will want to steal this image and use it for whatever reason, but anyway, I digress. The first video is an introduction to the course and what you are going to learn. After clicking on the button to access the course material, it brings you to all the modules in ecom success center. So here is what you get as far as the modules go. There are 8 sub sections here and the first one is the most intense, Shopify setup, where there are 8 videos telling you how to set up your store. Here are all the sections in this module in order. There are 15 sections in the Sourcing Products Module. Adrian goes into a lot of detail here and it’s a big module but pushes a lot of products from Teelaunch that everyone else is doing. Nothing really groundbreaking here, but still has some useful information. You are still left wondering what to sell after this module but at least you might get some ideas. Adrian also gives you access to Art licensing and i’ve taken advantage of it but the problem is you are limited to 10 artists and some of them you wont be able to use their work. The best ones are usually used by everyone else, so by now most designs are probably saturated. In this module, Adrian does a pretty good job of explaining how to set up your ads for maximum success. He does things differently than other marketers and it’s hard to say if this is the right or wrong way. However he insists on certain settings whereas other 7 figure ecom marketers do something different and explain why. Not sure who to believe? I think i’ve listed quite a bit already so don’t want to bore you further but in this module you are going to learn things like how to setup mailchimp, how to set up free promo offers, what to do with non openers, mailing non-clickers and so on. Email marketing is important and he does a pretty good job explaining why. Nothing that you can’t get anywhere else to be honest though. This module is really for those that have “made it” so to speak. If you’re racking in the dough, it’s time to start outsourcing so this module explains how to do all that. Helpful if you are making money, not if you are a newb. Again, this section is for those who’s ecom business is flourishing. It’s all about managing your business if it takes off. Here Adrian Morrison talks about selling your business. It’s true that you can sell your store for a lot of money if it is a success, but my gut feeling is that you are probably more interested in building a profitable business rather than already thinking about selling it. However, not a bad module if your store becomes a success. Not really useful for newbies. In this Module, you’ll find recordings of daily live coaching. His brother Anthony Morrison has a module on email marketing which is pretty good as well. Adrian also has a free tool that he offers that is called the sizzle sniper software and it is explained in this section. It’s a tool that helps you identify products in Ali Express and also shows ad performance in Facebook. Here, Adrian gives you case studies of products that he has sold – some have generated close to $500,000 in sales. I actually tried this myself, using the same copy and a split test, with the same audiences that he used and I had no success with it. The reason? These products peaked and then died. They were basically a trend and now any sales would be very minimal. This is very typical in the ecom world. There’s a lot of information to take in, no doubt. But for the $2495 price tag ( I think that’s what I paid) I would much rather invest in Franklin Hatchett’s Ecom Elites course. I heard a lot of people discuss the Adrian Morrison scam but I don’t believe that. He’s got a decent product, it’s just very pricey. The reason I say this is because the content is similar, but Franklin doesn’t go into things like selling your store or hiring staff to run it. He focuses on getting sales. Also, Adrian Morrison never discusses instagram influencers when Ecom Elites has a full module on it. That’s huge in ecom and should not be missed! That’s a HUGE difference. The money you save can be put to use in Facebook Ads. If you think that Franklin’s course doesn’t go into detail like Adrians ecom course, you’re wrong. There is just as much information, if not more. So go ahead and read my Ecom Elites Review. Judge for yourself. The value you get is tremendous. It’s a complete ecom course from start to finish. Or, click here to go to the Ecom Elites official site. Please comment below what you think. Whether you are member of either course or not, i’d like to know what you have to say. Ecom Elites is my #1 choice for either newbies to ecom/drop shipping or those already in the game. In my opinion it's the best course available right now for Ecom. For only $197, you can't go wrong. Check out my eCom Elites review or head on over here to see more about eCom Elites.